From Division 76 Talquin May 16 & 17, 2015 Len Lindahl from Alford, Fl. is one step closer to the ABA National Championship with a 1st Place win and $420.00 in the American Fishing Tour Divisional Bass Tournament held on Lake Talquin this past weekend . Len’s ten bass weighed in at 44.73 lbs. Second Place went to Mitch Oldnettle with a weight of 13.15 lbs., Third Place was Stan Chandler with a weight of 8.26 lbs. Big Bass went to Len Lindahl with an 7.78 lbs. Largemouth. These anglers are acquiring valuable points to insure their birth in the American Fishing Tour National Championship that will be held this fall. Their points are also being used to determine the divisional angler of the year. The top angler by points earned in this division will represent the division in the Angler of the Year final round. Conditions: The weather was warm and sunny with moderate winds. The lake level was full and the water was stained. Winning Strategy: Len caught his fish with a frog on a shallow sand bar. From Division 76 Talquin April 25, 2015 Allen Raines from Marianna, Fl. is one step closer to the ABA National Championship with a 1st Place win and $210.00 in the American Fishing Tour Divisional Bass Tournament held on Lake Talquin this past weekend . Allen’s five bass weighed in at 12.71 lbs. Second Place went to Len Lindahl with a weight of 9.33 lbs., Third Place was Mitch Oldnettle with a weight of 6.91 lbs. Big Bass went to Len Lindahl with an 4.74 lbs. Largemouth. Athens, Al - Mark Scott of Panama City, FL won the American Fishing Tour Florida - Talquin Division 76 tournament with five fish weighing 12.68 pounds held on Talquin on 03/14/2015. Second Place went to Mitch Oldnettle with a weight of 6.28 pounds. Third Place was Len Lindahl with a weight of 2.92 pounds. Athens, Al - Rob Lawhorn, of Quincy, FL won the American Fishing Tour Florida - Talquin division 76 tournament with five fish weighing 18.64 pounds held on Talquin on 01/17/2015. Second place went to David Boyd with a weight of 12.74 pounds. 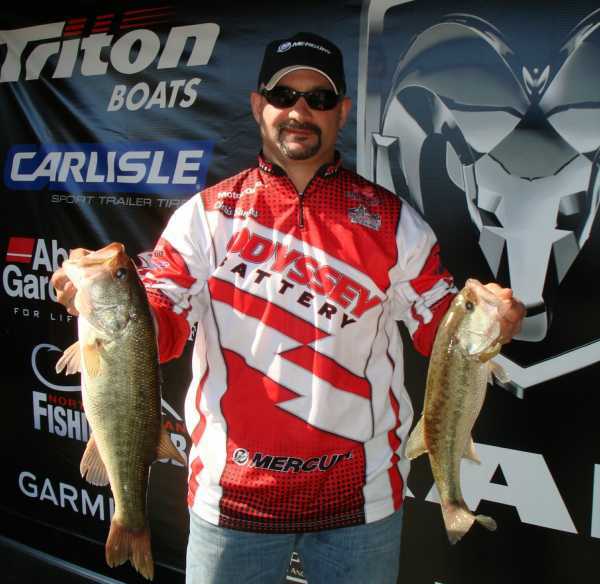 Third place was David Howell with a weight of 2.19 pounds.